It’s the first week of the semester. As I noted on Twitter (and therefore FriendFeed) yesterday, one of the recurring side effects of that is that the emergency exit alarms go off all the time. It’s the emergency set that are the problem. They are always a problem. Those of us who have watched them be a problem are baffled by it. I mean… really. Yes, there is a giant lit EXIT sign. I know. It’s required by law. It makes people think this is the way out of the building. Yes, it looks just like the doors that people normally come and go through, but, well, that’s because it is, and was designed that way. There are also three foot-wide STOP signs on the doors, at eye level, in red, octagonal in shape… all of the traditional STOP indicators. And yet people walk on through. So we end up putting up temporary signs for the first part of the semester, in a vain attempt to steer students away until they learn. People have suggested that we lock the doors. Can’t do that; Emergency Exit. People have suggested we take down the EXIT sign. Can’t do that; Emergency Exit. People have suggested we use velvet rope to block it off. Can’t do that; Emergency Exit. People have suggested clearer signage. We’re at a loss as to what would be clearer than what we have. Mostly, I think the problem lies in two things: One, most people don’t read ANY signs, even good ones. And Two, lots and lots of our users leave the library talking on their phone or chatting with friends. And they’re not paying attention to anything but what they themselves are doing in that moment. Makes you fear for the ones talking and texting while they drive, doesn’t it? So I guess this is all just to say that I want to make the best possible library experience for our users… but sometimes I think the users are just gonna have to pay attention to their world. There’s only so much I can do for them. Of course, any brilliant ideas on how to solve this problem are totally welcome. I’m tired of listening to the alarm go off! ETA: You can all stop suggesting we buy new gates and open the doors. That is not a practical option. Try again! I suggest shooting the first couple students who try to exit through those doors with a tranquilizer dart. Then let them lie there until they recover as a warning. Wow, those emergency exit doors are unlike any I have ever seen, I’m not surprised you get people walking through them. Buy another set of security gates? Expensive, I know, but maybe still something to consider. I wonder if we could frost the glass? Hrm. And no, no money for gates. We have to replace the ones we have, and that’s a challenge in and of itself! Maybe? But we’re trying to REDUCE noise in the library (and/or contain it), so that’s a challenge, too. Libraries: Complex Ecosystems. I like the frosted-glass idea. If you can get it past facilities management it might not even be expensive to implement. 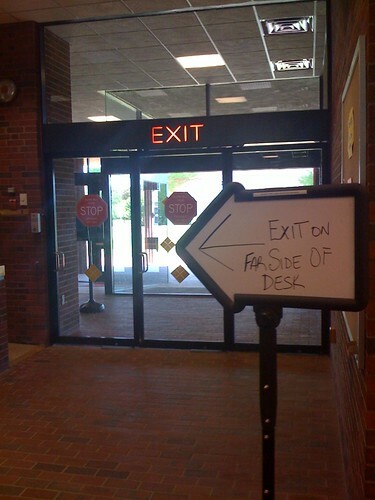 Don’t suppose you could have the text “EXIT” be replaced by “EMERGENCY EXIT”? Not necessarily in the same font (as that would be huuuuuuuge, and your font is actually kind of friendly and rustic for something that should be alarming). Pay a person to stand in front of the doors. Or make it a volunteer job. Having been here exactly *cough* 13 years … I have always been amazed at people walking into/through those doors. Your predecessor’s predecessor had them X’d out in big yellow caution tape, and that would not stop people. 3) By walking through these doors they make a successful shortcut. They’re not inconvenienced by the huge blaring alarm mostly because they’ve already..well, have made their exit. So some at least do it intentionally. While not likely to happen due to privacy and the fact it’s mean, I’d be sorely tempted to wrangle the engineering students or cs students into making a system that will take a photo when the doors are are opened of the culprit and make a “wall of shame”. More practically, I do wonder about obscuring it with paper, although I don’t know if that affects the fire codes. Jon – the doors don’t open well. All of the students I’ve ever seen go back into the library proper, and go out the correct door. Nice try, though. Sounds like it would be worth getting more security gates & opening the doors. Barring that, I’d suggest looking at other emergency exit signs you encounter and considering how yours are the same or different. One thing I noticed immediately is that “STOP” is the biggest word, not “Emergency Exit Only” which is a more standard way to indicate that a door is, well, for emergency exit only. I stopped over on my way from Google Reader to suggest what Jason and Dorothea both did…frosting, papering, tinting (really dark tinting might be best). Anything you can do to the glass to render it no-longer-transparent. That, or an alligator pit. Your call. Hmmm… at my former place of work in Texas we had this same problem and solved it with a special type of exit door that was wired into our fire alarm (first a specific alarm, smoke detector near that door, then the new building-wide system). If the fire alarm / smoke detector was not sounding the door would beep loudly when someone tried to open it and it paused for 5 seconds before the lock released. This gave staff time to catch any potential thieves and patrons learned quickly not to use the door because it didn’t open right away and also because the door alarm had a visible flashing red light on it. If there was a real problem, the door would open eventually. If the fire alarm / smoke detector was sounding, the door would open immediately and would not beep when someone tried to open it. This setup was much cheaper than extra security gates and passed all required fire codes. Trust your users and open up the doors? People are telling you something about wanting those exits. To reduce motivation to “steal,” lengthen your loan periods. Most of your journals are probably online now in contrast to when the security gates were installed. As for opening the doors, a) I’m going to insist on security gates that we can’t afford, and b) we use that alcove for programmatic space — catalog check stations, reserve checkout, announcement and suggestion board, etc — and so making it an official entrance and exit actually decreases the usability of our limited public service spaces. We’re going with visually obscuring the view of the outside. We had an (unrelated) walkthrough with the campus Health and Safety officer today, and I asked if tinting/covering/frosting that glass would be acceptable, and he’s going to help us find a solution that meets code. Apparently, like many of my favorite campus colleagues, he’s all in favor of “clever” solutions to problems. I agree with the person who said that making “Emergency exit only” bigger than “Stop” might be useful. The stop sign is overused- I’ve seen it on bathroom doors (“Stop!… did you wash your hands?”) And other similar places. When students see the “Stop” sign, they might assume they know what it is going to say (“did you check out your books?”) and skip the rest. You could experiment with different signage before having something expensive made to see what’s most effective- a funny photo of some sort, a picture of a brick wall- anything you wouldn’t normally find on a door that will make people stop and take notice. I have to admit I’d probably be one of the people that would set off the alarm. I tend to walk around in a cloud, not noticing my surroundings. Bad, I know, but I’ve been that way all my life (I used to actually run into walls, but I’m a little better now). It sounds like you (a) have reached a decision and (b) would prefer people not use those doors even if money for the security gate was no object. So my idea may be moot anyway, but here it is. Move the security gate, so you have to go through it before you get to any doors. Actually, I assume that this is not possible, or you would have tried it already, but I’ll mention it anyway. I wish we could move the gates, and open those doors. But the lobby was designed to suit the desires and classic style of the architect, and not practical workflow or library space usage. Opening the doors would be sort of a traffic-flow nightmare… and we’d lose usable space. and there’s just no way to put the gates in so that they’re not by the doors — the elevators, cafe, photocopiers, and library classroom are all outside the probable envelope for that.